In the aftermath of pro- and anti-Trump demonstrators clashing in Berkeley over the weekend, the two sides found common ground: Both say police did not do enough to prevent the violence. 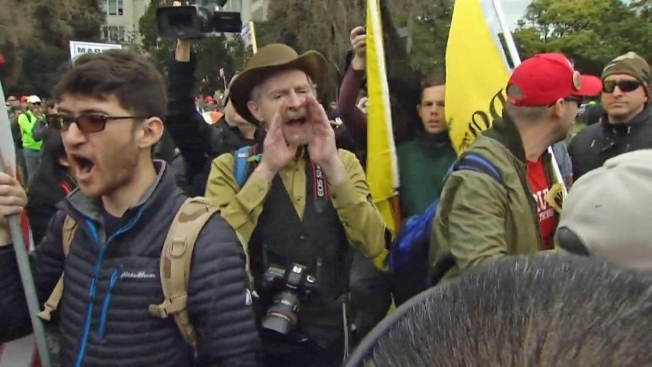 Punches were thrown, pepper spray was fired and sticks were drawn after the scheduled March 4 Trump in Berkeley met with a counter-protest Saturday. The result was 10 arrests. Organizers said the pro-Trump march was supposed to be a peaceful event. They said the event became violent only after a group of anarchists tried to stop it. The demonstration was supposed to end at the UC Berkeley campus, but the outbreak of violence prevented that. It was a similar scene to what occurred during the Milo Yiannopoulos protest. Cal student Pranav Jandhyala was caught in the middle, shooting video at the March 4 Trump. "Definitely violence on both sides, but I will say the Trump supporters were trying to assemble peacefully," Jandhyala said. As the violence heightened, a line of Berkeley police officers in riot gear could be seen standing about a hundred feet away. "No one is in the middle trying to break apart this conflict," Jandhyala said. "Like, you guys need to get involved." For those arrested, charges included battery and assault with a deadly weapon. The Berkeley Police Department said in a statement, "Because of the nature of the crowd, police are not always able to make immediate arrests without inciting further violence or injuring peaceful bystanders." But Trump rally organizer Rich Black said police refused to handcuff more and took too long to keep the peace. "We had someone with a broken noise, split eyebrows," he said. "It was just excuse after excuse. The worst was 'We can’t see what is going on.'" Berkeley police and the city of Berkeley had no further comments on the event. Meanwhile, pro-Trump organizers said they plan to have another march sometime in the future, one they hope will stay peaceful.